« Hard to See and They Usually Last Only for a Few Seconds; What Are They? This blog was published at about 5:30am from my Mom’s home at Holbrook, Long Island, NY. It took me about 2 hours to assemble this post which makes 264 consecutive days with a brand new blog post. 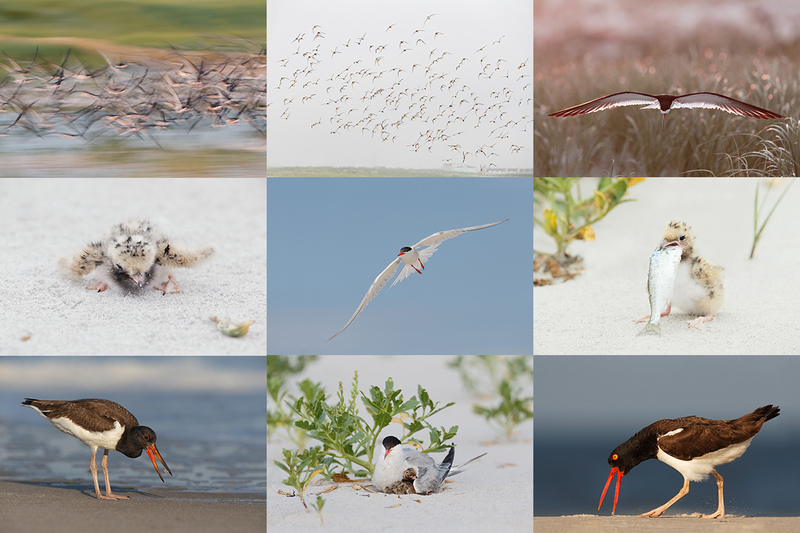 I am in NY for a week of visiting my elderly (gonna be 92 soon) Mom, my younger sister Arna, my younger daughter Alissa and her wonderful family, and doing some late summer bird photography. From Greg Gulbransen: Lots of skimmers feeding chicks out front in the open at Nickerson. Lots of photo ops. Next week will be perfect. For info on my 2-DAY IPT next Monday and Tuesday scroll down here. Call 1-863-692-0906 and ask Jim about the very late registration discount. The first 2015 Palouse IPT is sold out with a long waiting list. There are now just 4 slots left on the Palouse IPT #2. Scroll down in this blog post for complete details. Selling your used (or like-new) photo gear through the BAA Blog or via a BAA Online Bulletin is a great idea. We charge only a 5% commission. One of the more popular used gear for sale sites charges a minimum of 20% plus assorted fees! Yikes. The minimum item price here is $500 (or less for a $25 fee). If you are interested please e-mail with the words Items for Sale Info Request cut and pasted into the Subject line :). Stuff that is priced fairly–I offer free pricing advice, usually sells in no time flat. In the past few months, we have sold just about everything in sight. You can see the additional listings here. Immediately below is today’s featured listing. This image was created at 11:04am on a very cloudy day on last July’s Nickerson Beach IPT with the hand held Canon EF 70-200mm f/2.8L IS II lens , the Canon Extender EF 2X III (at 140mm), and the Canon EOS-1D X. ISO 800. Evaluative metering +1 stop as framed: 1/250 sec. at f/6.3 in Manual Mode. Color Temperature 9100K; what was I thinking? But with RAW capture it was easy to cool down the image with the Color Temperature slider in DPP 4.0. Central Sensor Surround/AI Servo Rear Focus AF on Dave’s neck and re-compose. Click here to see the latest version of the Rear Focus Tutorial. Click on the image to see a larger version. Above is multiple IPT veteran Dave Klein on last July’s Nickerson Beach IPT, the one that I co-led with Denise Ippolito. What did Dave do right? Lot’s. First, he selected a nice clean section of beach. Though you can’t see it in this image he approached the birds lowly and slowly. Just like we taught him. And though the birds were very tame, he went off by himself and found a cooperative family. That made it much less likely that the birds would be flushed. And most importantly, he got down low. Though you can’t see his left hand and arm, he is properly supporting his Nikon AF-S NIKKOR 80-400mm f/4.5-5.6G ED VR lens 80-400 VR II with his left hand well out on the lens barrel. What did I do right? Lots. I made sure that I had the right exposure and set that manually. That is very important because if I had been in an automatic mode the white of the breaking waves would have fooled the meter. I focused on Dave and recomposed. After pressing the rear button to set the focus I concentrated on standing stock still so as not to throw off the focus. 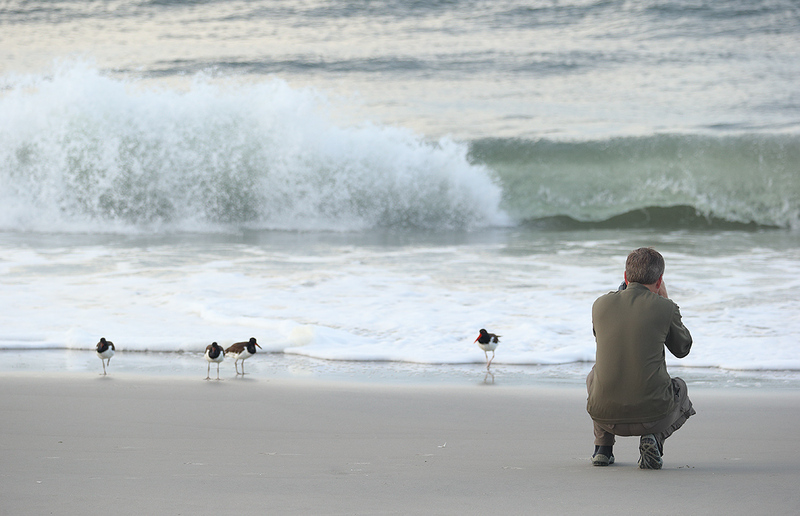 I chose a perspective that put Dave on one side of the frame with three of the oystercatchers on the opposite side of the frame. This yielded perfect compositional balance. What made this image the best of the series? I timed the breaking wave to mirror the four birds while the green part of the wave served to set Dave off nicely. As you have come to learn here, stuff like that does not happen by accident. As Sam Abell (check spelling) said in his keynote address at NECCC, “See the situation, compose the shot, and then wait. “ Though he was a documentary photographer his advice is often spot-on for nature photographers as well. Why is the arrangement of the birds slightly less than perfect? Is there anything else about the image that bothers you? Dave created this image on the Nickerson Beach IPT that I co-led with Denise Ippolito in a similar situation with the Nikon AF-S NIKKOR 80-400mm f/4.5-5.6G ED VR lens (hand held at 125mm/Digital Zoom: 1.5X = 187mm) and the Nikon D600 (now replaced by the Nikon D610 ). ISO 1000. Matrix metering +2/3 stop: 1/640 sec. at f/8 in Av mode. AWB. 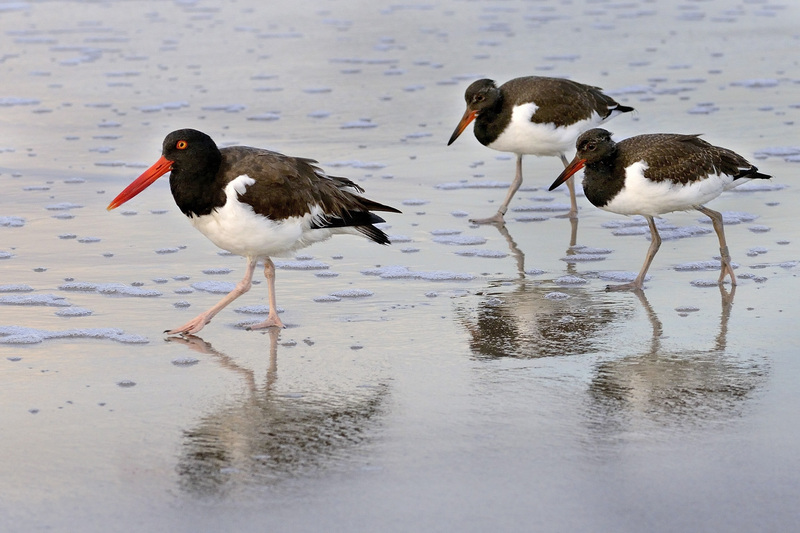 The three birds here are perfectly juxtaposed and the image is sharp and well exposed. With a relatively short focal length, f/8 was more than enough to cover the entire family. I like the foam left over from a breaking wave and I love the soft reflections. The image is beautifully framed/cropped with more room in front of the lead bird than behind the last bird. This image was created in soft light on the late afternoon (5:21pm) of July 17, 2014. Yikes! I almost forgot: three very good head angles. The Nikon D810 DSLR has been hard to keep in stock since its recent release. B&H just received a large shipment of the camera that is reputed to create the highest quality images of any dSLR on the planet…. Call 1-863-692-0906 and ask Jim about the very late registration discount. Call Jim or Jen weekdays at 863-692-0906 with a credit card in hand to register and to pay in full. Please print, complete, and sign the form that is linked to here and then shoot us a scanned copy via email or bring a hard copy with you to the workshop. If you have any questions please feel free to contact me via e-mail or on my cell at 863-221-2372; please leave a message if I do not pick up. 12 comments to Who Did What Right? “Why is the arrangement of the birds slightly less than perfect? I was actually thinking of another one of Mr. Dave’s images. Here I think that the arrangement of the two young birds is perfect; I love that the head of rear juvie is set against the white underparts of its nest-mate. Had it merged with the dark upperparts that would have been a major problem. And I like the juxtaposition of the two young birds and have zero problems with the bill of the rear bird crossing with the leg of the front juvenile. The only thing that bothers me about the image is that I did not create it :). Lots Mr. Dave images more coming on Saturday. I like Mr. Dave’s image. In a perfect world, I’d like the middle bird to be clear of the right-most bird. Perfect worlds are rare where I live. Interesting that the juvies both are banded, while the adult is not. On Nantucket, where I often see AMOYs, it’s rare to see an unbanded adult. Typo: In the paragraph titled “What Did Mr. Dave Do Right?” you have a greengrocer’s (unnecessary) apostrophe in the word “birds” (“bird’s”). Thanks for the catch of my typo. Do you know the derivation of the term greengrocer??? Artie: Not to harp, but I don’t see an Amazon link to the right of the page(s) and the Amazon link at the bottom of the post isn’t there…. After looking at the picture again would like to see a few more degree of head angle on the adult. Good morning Artie and have a great day. One or two more degrees toward us would be great but it is pretty good as is: square to the back of the camera…. I would like to see the juvenile birds offset more .Also the closer juvenile is in a position with his bill down that it intersects the leg on the other bird. I also noticed both juveniles were banded. A somewhat better arrangement of the birds would have a bit of space between the tails of the 2 birds that are closest together. I would like to see the bills of all the birds. I would also like to be there! Photo ops look fabulous!